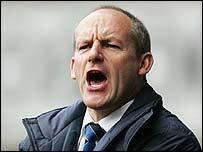 Reading boss Steve Coppell has signed a new contract to keep him at the Madejski Stadium until 2009. Coppell has departed from his usual policy of extending his contract by only one year, to sign a two-year deal with the Royals. The 51-year-old took over the reins at Reading in October 2003. He told Reading's website: "For the club to have faith in me is pleasing, now I want to repay that faith by doing my job to the best of my ability." Coppell guided Reading into the Premiership for the first time in their history after romping to the Championship title last season. Under the former Crystal Palace boss Reading have taken the Premiership by storm, defying many pundits' predictions they would struggle. Instead, the Royals are now pushing for a place in European football for next season. Reading chairman John Madejski said: "We're highly delighted that Steve has agreed this new contract. "He is widely regarded as one of the most respected and successful managers in football. "The fact that he has pledged his future to Reading gives the players, staff and the whole club a great deal of security for the next two years. "Steve and I have an exceptionally good working relationship and I always had complete confidence that he would sign this contract. "He has obviously played a vital role in our success so this is a real red letter day for the club. "We look forward to continuing to work together and taking Reading even further."